We conducted a workshop for 20 persons on Warrior Soul Care at 15th Street, United Methodist Church in Huntingdon, Pennsylvania. The workshop focused on mission and ministry assisting the local church to receive and re-integrate returning veterans into the community of faith and the community at large. The church is uniquely positioned to help our returning veterans who may have experienced a wound of mind and spirit. 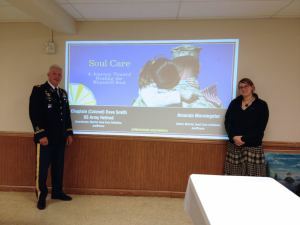 We also participated in the 2nd PA Veteran Forum in Grantville, Pennsylvania where we conducted a seminar on Soul Care: Journeying toward Healing the Wounded Soul. We were able to introduce 75 mental and behavioral health providers, medical care providers, and veterans and families of veterans to the literature and research on the benefits of spiritual grounding, the realities of spiritual trauma experienced in combat,and explored the strategies and resources for soul care to include integrating faith-based communities in the healing of the wounded soul. Keep checking soulcareinitiative.org for information about future workshops and feel free to contact us (dsmith(at)justpeaceumc.org) if you’d like to host a Soul Care workshop in your congregation or community.